Sellers Notes This week can also be purchased as part of a group of ownerships through Breckenridge Grand Vacations at the highly discounted price of $125,000.00. Also included are the following: Grand Timber Lodge, Week 51, Unit 5105, two bedroom lockout, annual usage, Float Christmas Season Grand Colorado Peak 8, Week 33, Unit 1221A, one bedroom, even year usage, Summer Value Season Grand Timber Lodge, Week 35, Unit 832, two bedroom lockout, odd year usage, Float Summer Season If interested in any of the above units alone please make an offer! 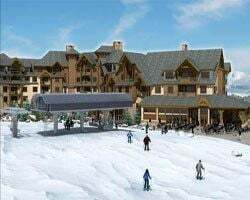 This new spectacular resort is located on Peak 7 of the Breckenridge Ski Area. This beautiful ski in/ski out resort is considered by many to be the crown jewel in the local skiing scene. Planned resort amenities include indoor/out swimming pools, hot tub, restaurant, spa and fitness facilities, and game room.